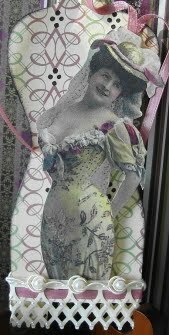 Vada's Blog Stamp Inks and Paper : Tag Tuesday Challenge is “Mannequins”. Over at Kard Krazy, Louise has a really fun challenge this time around. For mine I only used one little stamp from Hero Arts. My graphic came from “Magic Moonlight Graphic’s”. everyone is having too much fun with this one--time for me to jump in and make one of my own. I love what you did with yours and learned from you a new site for images. so glad I paid you a visit! What a lovely tag! That image is fantastic and so are your embellishments. Oh Vada this is just beautiful! I love the background and that image. The lace trim you used is just perfect! Love it! I love the sassy image that you used on your tag as well as the trim on the lower edge. So glad you could join the fun with my challenge this week. Adorable! I should have thought to add the link, darn it! I love this tag, with all those lovely bits of trim and embellies! Stunning tag and the lady is a perfect compliment to the beautiful shape of it. I have a new challenge over at dezinaworld if you fancy a try. 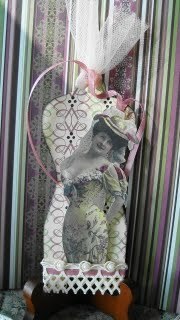 Oh yes, the lovely lady is indeed wearing a corset, made upon the very mannequin she's trying to hide, LOL! Beautiful tag - love it! Another WOW creation, Vada! Your tag is absolutely fabulous! Gorgeous - so pretty - love the lace and ribbon detail.